MASKerade: Muse #53 - Welcome Vicki! Muse #53 - Welcome Vicki! This is Vicki's first week as Muse. I was so thrilled when she agreed to become a member of the Muse DT! I love her work - she is so very talented (and she's very nice and funny to boot! ), and I have been so looking forward to playing along with her first inspiration card! But, despite its beauty and serenity, I admit that this week's Muse, with its muted colour scheme had me stumped for a while! This card came to me in stages but the real breakthrough was remembering that I have this brilliant yellow vellum that really adds a punch of colour to the card, as well as making beautiful butterfly wings because it's translucent. And in the end, I'm really pleased with this card that I would never have made if it wasn't for Vicki's inspiration, so thank you Vicki! From Vicki's card, I used the butterfly (same MFT dies as Vicki, in fact!) the circle, the vertical stripes (embossed with my grosgrain embossing plate from MFT), the dots and the fishtail on the sentiment. I hope you'll get a chance to play along! Don't forget that the deadline is Monday morning at 8:00 am EST. Voting goes from then until Tuesday morning at 8:00 am and then the results will be posted on Tuesday at noon! Wow!! I LOVE that bright yellow butterfly on the grey background! Beautiful! Beautiful card, striking colors and design! I'm really loving this butterfly. Think I will have to put that die on my wish list!! Love that butterfly. It is so very striking. One of my favorite color combos recently ... sunny yellow and dapper gray. Know what your card reminds me of? A well-dressed man with a gray wool jacket and a flashy yellow silk hankie in the pocket. Love how crisp it turned out! I love how the yellow butterfly pops against the gray. This is so pretty. Gorgeous! 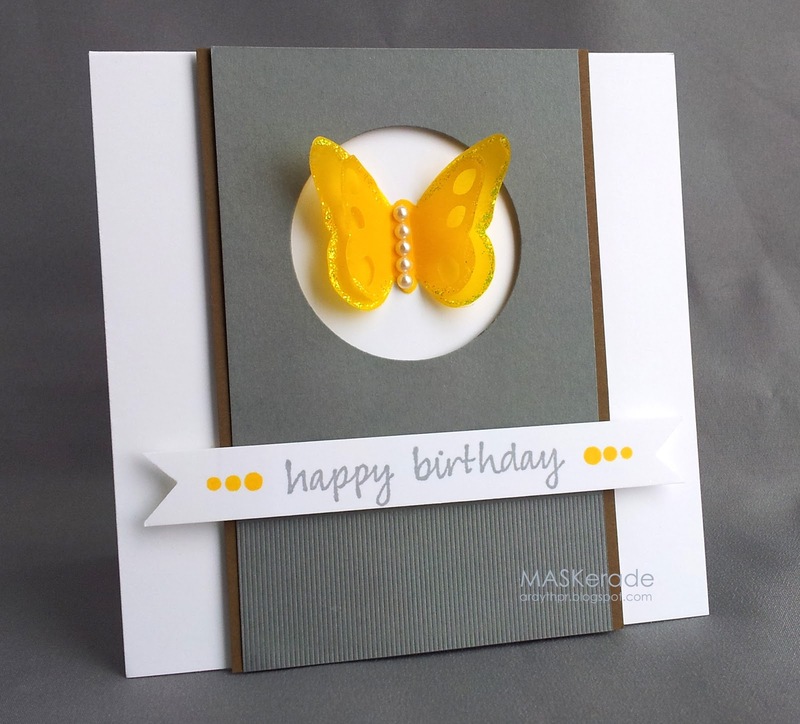 I love grey and yellow :) your butterfly looks fit to burst from the page and it's a wonderful take in Vicki's card :) I have to say, the muted palette had me stumped too but I'm gonna stick with it and see what happens! That yellow butterfly looks wonderful with the gray! I. Love. This. Card. That's all. Love it! WOW!! I LOVE these colors together!! I also love the texture you used on the bottom of the gray. It looks so cool. Thank you for commenting on my "Festive Friday" card. It was so thoughtful of you. Love that punch of bright yellow, Ardyth! An amazing card! Ardyth, this is just stunning in the neutrals with the brilliant pop of yellow! Love!